A bird eat one, Dat left nine. They all turn yellow, An' one a dem sneeze! This wonderful number rhyme comes from A Caribbean Counting Book by Faustin Charles and Robertan Arenson. Because we enjoyed it so much, I added some visuals and this rhyme has turned into a regular game. This game is a fun way to practice counting to ten, and introduce subtraction. The charming rhymes are what led me to this book in the first place. The practice of pinning up the bananas, turning them over, and taking them down is a great fine motor skill work out. Here's how you can enjoy this rhyme with your preschoolers as a hands-on counting activity. 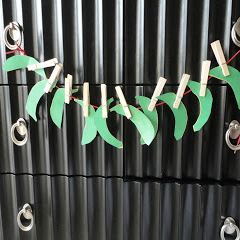 You'll need green and yellow construction paper, glue, string and clothespins, as well as a place to hang your bananas. 1. 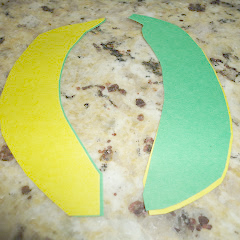 Start by cutting out identical rectangles from yellow and green pieces of construction paper. 2. Holding the two pieces of paper together, cut out a half moon from one side of both. 3. Cut along the other side to finish the banana shape. 4. Glue the two sides together. 5. Repeat for nine more bananas, making ten bananas that are green on one side, and yellow on the other. 6. Tie a string across the back of a chair, or on a dresser as above. Use clothespins to attach the bananas green side out. A bird eat one,". Next, I invite him to remove the banana that the bird ate. We recount and discover that leaves nine. The kids can help when them all turn yellow. Next, it's little sister's turn to decide which one sneezed. Count. Read a line. Remove a banana. Repeat, until "a chile start eatin' and that left only one." One couldn't take de squeeze, An dat left seven. One miss he grip, An' dat left six. De bird eat another one, An' den there was five! One fall 'pon de groun', An' dat left four. One slide off, Den there was three. One tumble down! An dat left two. An' dat left only one! I've been pleased to see that my son is beginning to recognize smaller numbers at a glance, but Caribbean charm of this little rhyme is reason enough to enjoy it, and I'm sure that's why my kids ask for it again and again. I hope you and yours enjoy it as much!